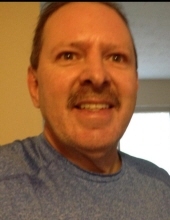 Michael R. Dufresne, age 54, passed away on Saturday, March 16, 2019. He was the cherished son of Eva (Gerald) Popham and Malcom Dufresne, dear and loving brother of Robert S. Dufresne, Yvette M. Graham, Richard H. Dufresne, David D. (Stacey) Dufresne, Anthony C. Dufresne, Debbie (Tim) Napier, Lisa (Kurt) Diemler, Benjamin (Amy) Popham, and Matthew (Myra) Dufresne. Michael will also be missed by many nieces, nephews, cousins, family, and friends. A Graveside Service will be held on Thursday, March 21, 2019 at 11 AM at The Pierce Township Cemetery, 950 Locust Corner Rd., Cincinnati, OH 45245. "Email Address" would like to share the life celebration of Michael R. Dufresne. Click on the "link" to go to share a favorite memory or leave a condolence message for the family.